Thermal shock – shock-like temperature fluctuations linked with the thermal expansion coefficient of materials – can lead to fractures in contacts and cables, cracks in the resin, and cause gaps to open up between the resin and plastic parts in sensitive and complex electrical and electronic components such as control units and sensors. To increase the resistance of electrical and electronic components to thermal shock, German-based RAMPF POLYMER SOLUTIONS has developed a comprehensive portfolio of high-performance polyurethane electro casting resins whose outstanding thermomechanical properties have been confirmed in dynamic-mechanical analyses (DMAs). Thanks to the use of non-abrasive fillers, the RoHS-compliant, RTI-listed polyurethane systems can be processed on standard 2-component mixing and dispensing systems. Resins are also available that are flame-retardant to UL 94 V0. RAMPF Polymer Solutions also has the perfect solution for keeping components at the ideal temperature for their long-term functionality. 1- and 2-component electro casting resins with high thermal conductivity of up to 2.2 W/(m*K) ensure that heat is efficiently conducted away from the component, thus reducing thermal loads. The expertise of German-based RAMPF PRODUCTION SYSTEMS ranges from the casting process to the relevant automation solutions. 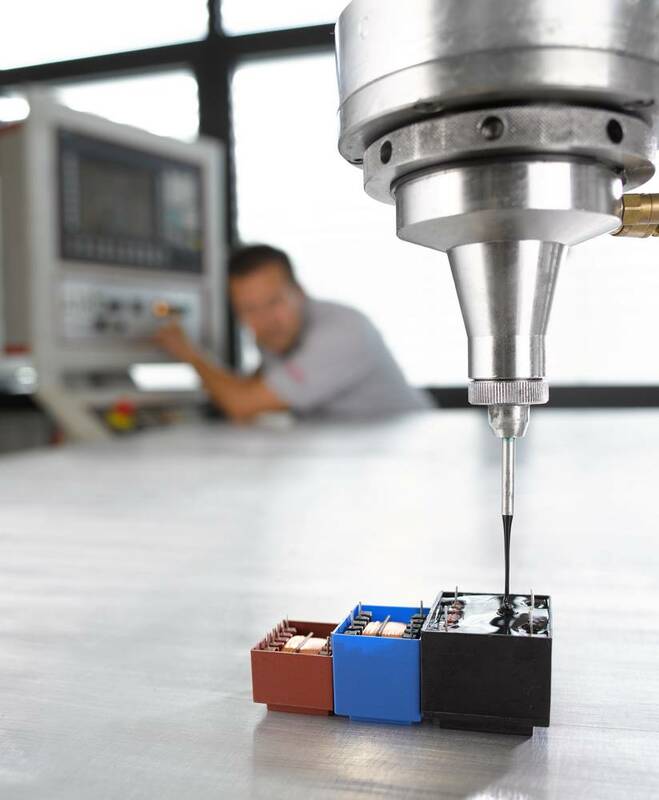 Casting under atmosphere – casting without process forces is a stress-free way of providing lasting protection for sensitive electronic assemblies. Casting processes (single- or multi-step) designed by RAMPF can be used to manufacture products that are reliably protected from contact, moisture, and damage. Casting in a vacuum – components with windings, narrow gaps or shapes that are difficult to vent can be cast without air bubbles in a vacuum. This creates products that meet high insulation re-quirements and work well for a long time, even in extreme conditions. The vacuum technology also enables the manufacture of optically transparent connections.